On July 9th–13th, Kundiman hosted its inaugural Youth Leadership Intensive at Fordham University Law School! Read on to see some highlights from our week together! Visiting Artist Wo Chan with the Youth Leadership Intensive students. Students worked on communication, teamwork, and public speaking, while building confidence, empathy, and creativity. Since we believe that successful leaders are not just ambitious and intelligent, but caring and empathetic, we began each day with meditation and a writing exercise. We learned about the rich legacy of Asian American literature and history through lessons taught by Ryan Lee Wong (History) and Caroline Lee (Literature). Below is Ryan Lee Wong's lesson on Asian American activism: He brought in copies of BRIDGE Magazine, a magazine put out by Asian American activists at Basement Workshop in the 70s and 80s, and the students loved paging through these documents of radical history. We met in small groups, led by our three wonderful Home Group Leaders (and Kundiman fellows! ): Dan Lau, Margaret Rhee, and R.A. Villanueva. Students met with a luminous roster of Visiting Artists and Power Lunch speakers for the week. Each day, we had a Power Lunch with an industry leader in fields of technology, medicine, publishing, law, and finance. Our Visiting Artists included poet and drag performer Wo Chan, National Student Poet Eileen Huang, and Hawaii-based poet Wing Tek Lum. Students having lunch with Tara Hariharan, head of research at NWI Management LP. It's summer in New York –– we had to get outside! The week included writing through Central Park and a field trip to the Museum of Art & Design to see Filipino American artist Cynthia Alberto's exhibit "Buhok at Anting Anting and Weaving Together." 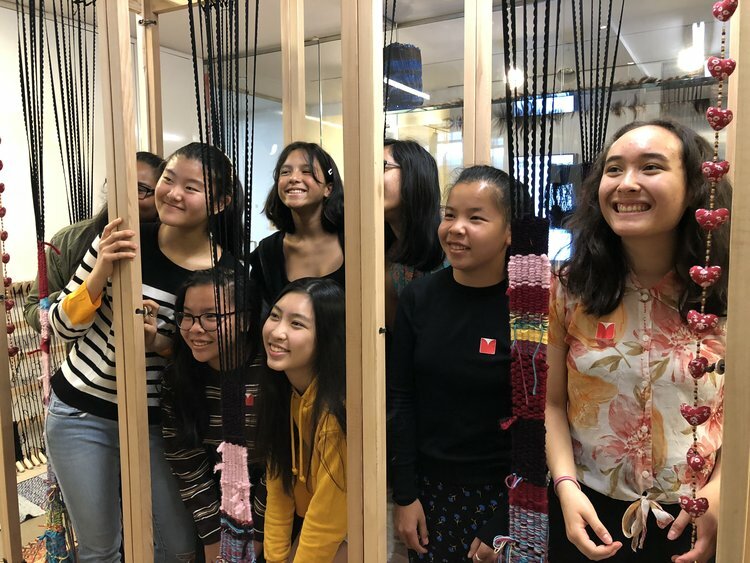 Alberto's exhibit was inspired by the use of human hair in the artworks and artifacts of cultures worldwide, and students were invited to donate their own hair to a new weaving that would go into the permanent collection at the Museum of Art & Design. They may have left with fewer locks, but now their hair will be woven into a museum forever. Each student took part in a Kavad oral history project, with the intent of creating an archival collection of young Asian America in all its brilliance and diversity. Stay tuned for the final project! All in all, it was a life-changing week, not just for the students, but for all of us involved. We have more photos of the week in our Facebook album. Thank you to our inaugural class of #KundiYouth18 –– you inspired and impressed us all! Emily Lu with Cynthia Alberto. Photo by Prashanth Kamalakanthan.